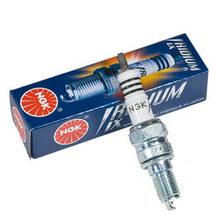 NGK's IX Iridium Series Plugs were Designed Specifically for the Performance Enthusiast. Ideal plug for Harley V-Rod and Buell models (see fitment below). Spark plugs sold each. Iriduium plugs are factory gapped. DO NOT GAP IRIDIUM PLUGS USING A DISC STYLE GAP TOOL. Attempting to gap Iridium plugs against the center will damage the electrode. Use a tool that will only bend the ground.